Voyage dans l'Amerique du Sud 1864-1865. 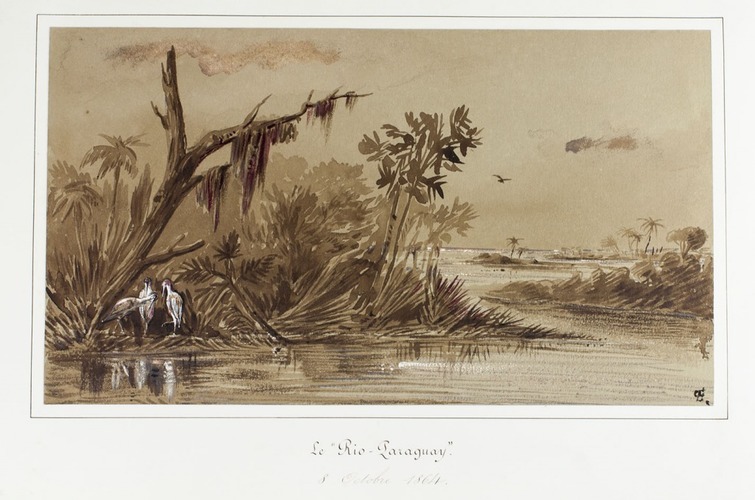 [Various places in South America], 1864-1865]. Oblong 1mo (ca. 33.5 x 52 cm). Album with 98 watercolours (the majority ca. 20 x 33 cm) mounted on the thick album leaves and mostly signed with monogram "E", titled and dated in ink on the mounts. Contemporary blind- and gold-tooled green sheepskin (Maison Alphonse Giroux, Paris). 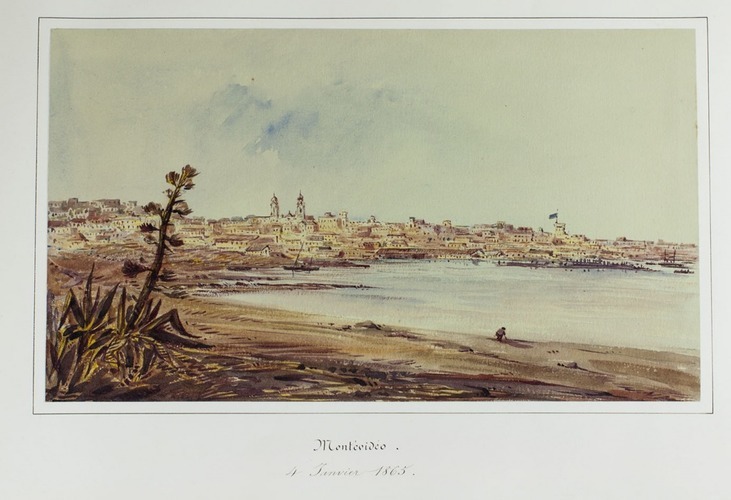 Album with spectacular watercolour views of many places in South America, painted by Edouard Quesnel (1842-1891). 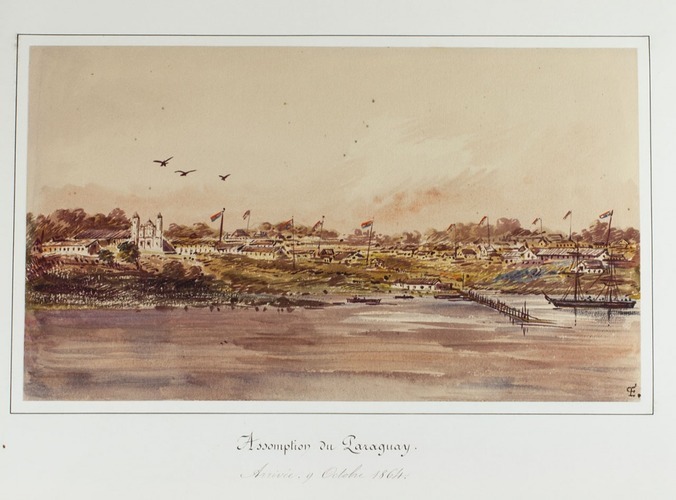 In June 1864, Quesnel undertook a voyage to South America and toured Brazil, Argentina, Uruguay and Paraguay before returning home to Le Havre in April 1865. 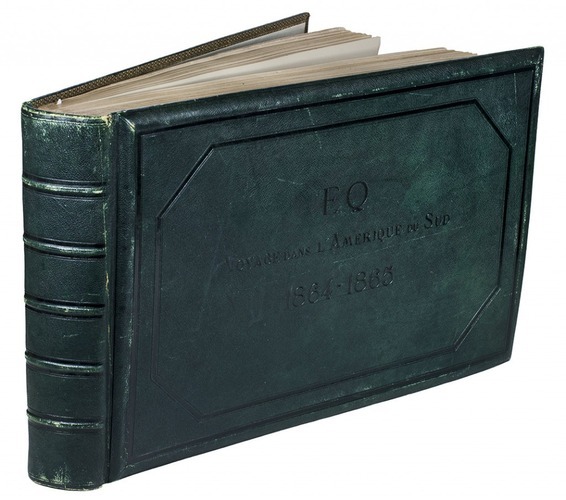 He recorded his impressions in the present album of watercolours and in a series of letters addressed to his mother. The correspondence was published posthumously as Souvenirs de Voyage (Rouen, 1892). Quesnel's letters often refer to the sketches he is making. 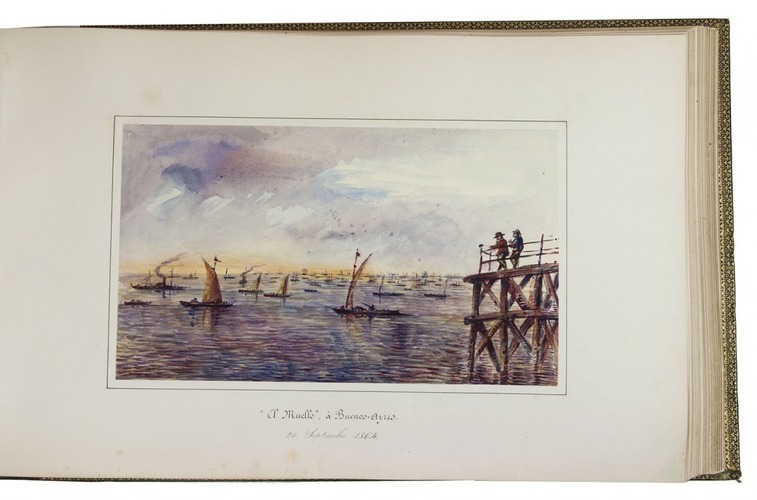 His remarks suggest that he based the watercolours in present album on those field sketches. He made them for his mother, writing to her from Montevideo on 13 December: "Ma chère et bonne mère ... en somme ce ne sont des croquis faits à la hâte, mais d'après lesquels on pourrait faire de jolies choses. Je n'en occupe surtout par la pensée qu'ils pourront vous faire plaisir à voir." (Souvenirs, pp. 115-116). Quesnel succeeds in painting precisely and at the same impressionistically, combining topographical exactness with very subtle nuances of light and colour. 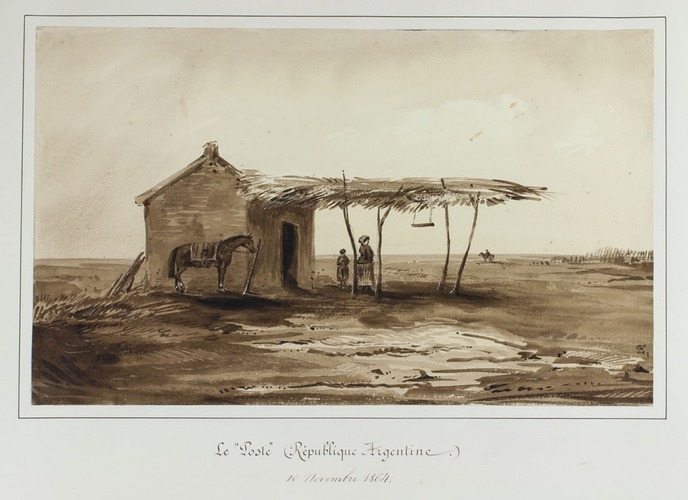 But he doesn't just reproduce the landscape, he also records his own, personal perception, reflecting the subjective experiences of a Frenchman travelling through South America in the 1860s. Little is known of Quesnel's work beyond the present album and a large album of French landscapes. With occasional minor foxing, but otherwise in fine condition. Part of the inside front hinge has come loose and there are a few small scuff marks, but the binding is otherwise very good. 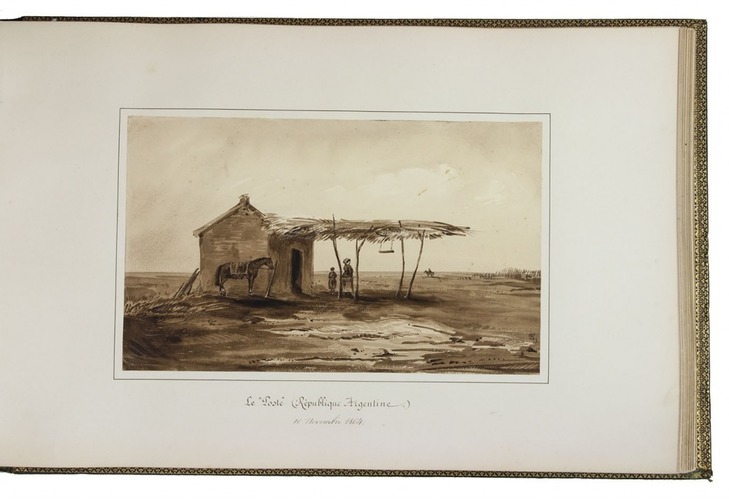 Splendid views of South America, made on a voyage in 1864 and 1865. On Quesnel: Numa Broc, Amérique, p. 269.